Notes: The present-day East Coast main line station at Durham was, in effect, the third station to serve the city of Durham. The first was the terminus of the Durham & Sunderland Railway (via Hetton) opened in 1839 which was actually in the village of Shincliffe a couple of miles south of the city. The second one, which the present station replaced in 1857, was on Gilesgate, the terminus of a branch from Belmont on the Darlington to Gateshead line via Leamside. 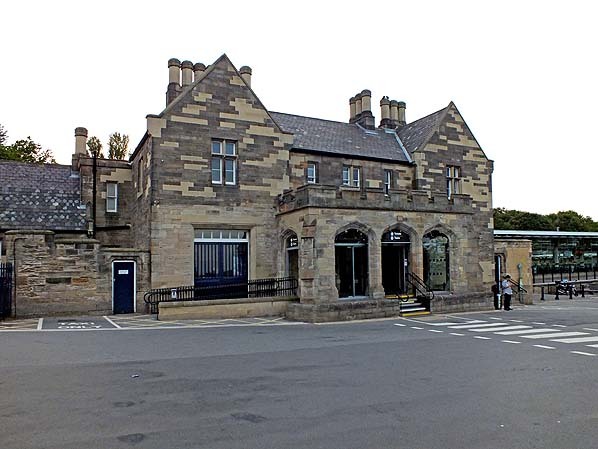 The fourth was Durham Elvet, opened in 1892 to replace the inconveniently located Shincliffe terminus – by that time renamed Shincliffe Town. 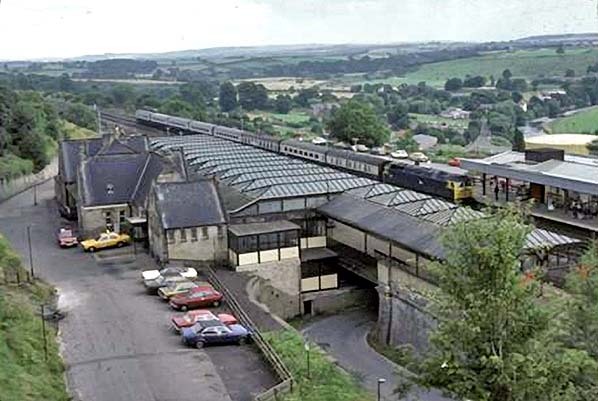 Today’s Durham station was originally just an intermediate stop on the Bishop Auckland branch from Leamside. However, as befitted the historic city, it was favoured with a most attractive building. Biddle (1973) notes the similarity of the Tudor-Gothic building to G T Andrews’ remarkable edifice at Richmond, and suggests that although the Durham building is credited to Thomas Prosser, the NER architect at its opening in 1857, it was likely to have been an Andrews design that had been laid aside when George Hudson’s downfall postponed the completion of this line. Biddle also remarks that the Dean and Chapter of Durham Cathedral opposed the construction of the railway, and the choice of a well crafted, traditionally styled building on the elevated site in view of the cathedral and castle could perhaps have placated them. The buildings on both platforms are in dressed sandstone. The main building is on the up (east) platform, and its frontage is a two-storey gabled block with a crenellated portico of three pointed arches in front and one on each side. Other features of interest are the groups of octagonal chimney stacks and mullioned windows. A screen wall formerly linked the building to the stationmaster’s house and refreshment room. The station sufficed for over a decade, but the re-routing of the East Coast main line through the station in 1872 required superior facilities. Consequently Prosser undertook major improvements in 1871-2. The site needed to be widened to the west, to accommodate two through platforms and bays for local services. The station originally possessed a trainshed, which was demolished. The main east side station building with its office range was retained for its original purpose, and it influenced the style of the new work, notably the booking office and waiting rooms on the new down platform; Fawcett notes that these formed a virtually independent station. The down platform offices took the form of a single-storey cottage-style pavilion, reflecting the Tudor-Gothic of the original station. He also remarks that with four tracks between the through platforms, goods and express passenger traffic could avoid the platform roads, and extensive circulating areas and bay platforms on both sides were also features of the generous accommodation offered by the station. In place of the trainshed there was fully-glazed ridge and furrow roofing, with a slated skirt at the platform edge. Fawcett’s description of the re-vamping of the original up side building refers to the rearrangement of the offices, the refreshment rooms being re-sited in a new building north of the old one, and a new ramped platform entrance being formed between the two. The new rooms were in a two-storey and raised basement block, appearing rather like a prosperous suburban villa, stylistically similar to the old building but ‘livened up’ with a crenellated parapet, punctuated by corbelled chimneys. Inside there were staff bedrooms and a sitting room on the upper floor. Downstairs was a large first-class refreshment room with a pair of bay windows looking out towards the city, while other travellers had to make do with a smaller room looking out onto the platform. The original station building ‘underwent some surprising external surgery at the same time: the turrets at the corners of the portico were replaced by angle buttresses, and the shaped stone mullions of the ground-floor windows were replaced by flat timber ones’. To increase office space wooden buildings were added to both platforms, including a general waiting room on the up side and a bay-windowed stationmaster’s office, with nicely detailed Gothic windows, on the down side. However not all alterations were in such good taste. Fawcett notes that the breaking through of the front wall of the original station, to extend the parcels office into a wooden lean-to with a vestibule formed by partitioning off one bay of the portico was unfortunate. In the Grouping of 1923 the NER network became part of the London & North Eastern Railway (LNER). Nationalisation in 1948 allocated Durham to the North Eastern Region of British Railways. In 1939 the Lanchester Valley route to Blackhill was closed to passengers by the LNER, and in 1951 BR withdrew the single advertised train per day on the Waterhouses branch. 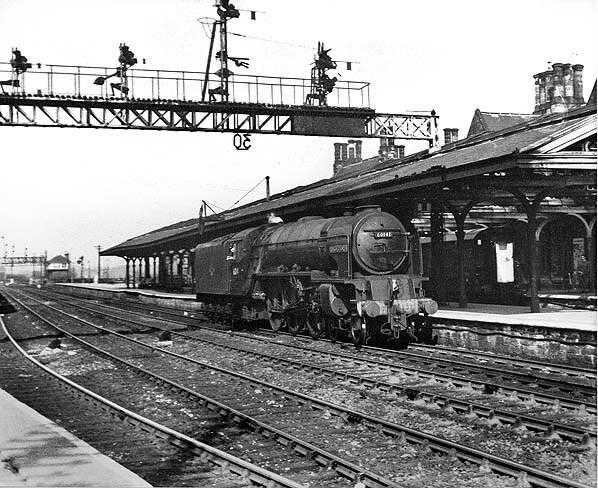 The two remaining ‘branch’ services, to Sunderland and Bishop Auckland, were axed by BR in May 1964, leaving Durham as a main line through station only. The station received unusual signage, probably very early in the BR era, of rectangular enamel tangerine nameplates, rather than totems, and these remained until the late 1960s, accompanied by standard BR(NE) running-in boards, until replaced with Corporate Identity signage. Further modifications to Durham station were made in the 1960s and ’70s which paid scant regard to the attractiveness of the buildings. The refreshment rooms were closed in the British Railways era and demolished. Fawcett (2005) is highly critical of Martin Little and Colin Phipps’ alterations, completed in 1966, in which Prosser’s original building was given over to parcels and a new station entrance was provided. A boxy new building was installed employing a modular timber construction, with plywood-faced cladding panels, and was designed to tuck under the edge of Prosser’s platform roof; the new structure housed a booking hall, offices and waiting rooms. In Fawcett’s opinion it looked like a temporary fix from the outset, and has worn very badly. The track alignment through the station (dictated by the need to reduce to two tracks on the approach to Durham Viaduct) impeded high-speed running by through expresses, so in 1969 the up centre line was removed to allow for realignment. In 1972 all of the tracks were moved eastward, requiring the narrowing of the up platform and replacing Prosser’s attractive verandah with a clumsy and inelegant structure – a combined portal frame and cantilever design with profiled steel sheet cladding. 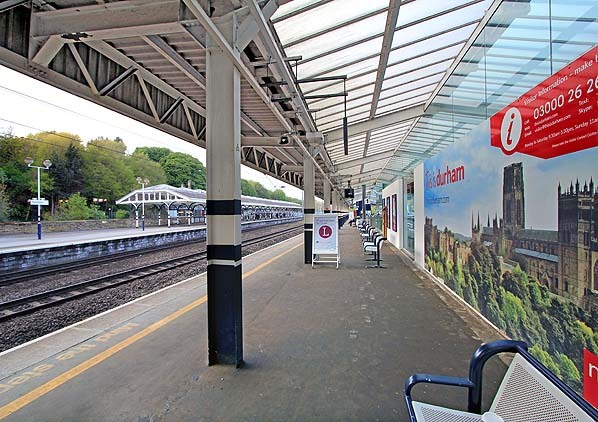 Despite the insensitivity of some of the changes to Durham station it enjoys Grade II listed status. Tickets from Michael Stewart (except 2165 JC Dean). Bradshaws from Chris Totty and Nick Catford. Route maps drawn by Alan Young. 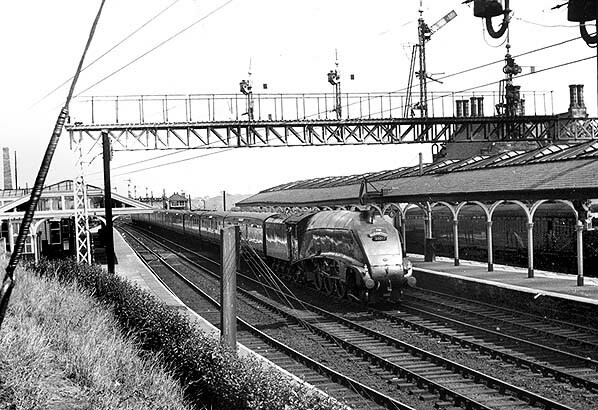 Looking north-eastward from the down platform of Durham in June 1953. The locomotive - and the fireman! - are working hard with a heavy Class C fitted freight on the stiff climb through Durham station to Relly Mill Junction on its way towards Darlington and York. The train is taking the up fast line which bypasses the platform. No.61415, a Raven-designed B16 4-6-0 was built at Darlington works in September 1920 and entered service at York North shed as No. 915. Renumbered by the LNER in 1946 to 1415, it was withdrawn as 61415 on 25 September 1961 and broken up at Darlington in March 1963. 1896 1:2,500 OS map. Durham station is shown after it was expanded in 1871-2 to accommodate the extra traffic that main line status would bring. The buildings on both through platforms look enormous because the cartographer has not distinguished them from the large areas of glazed roofing. Sidings can be seen both north-east and south-west of the passenger facilities, but the extent of the latter is severely curtailed as the Durham viaduct begins almost immediately south-west of the platforms. The engine shed is shown north of the station, but not named, with a turntable close to it. Looking north-east from above the down platform of Durham station in summer 1955. On the up platform the main building and the slated front of its ridge-and-furrow glazed verandah can be seen. No.60017 ‘Silver Fox’ is heading the up ‘Elizabethan’ (non-stop Edinburgh Waverley to London Kings Cross) on the fast line. The loco was built in 1935 and entered service at Kings Cross shed on 18 December. A Gresley-designed A4, it had a service life of nearly 28 years, when it was withdrawn from New England shed on 20 October 1963 to be cut up at Doncaster works in December. 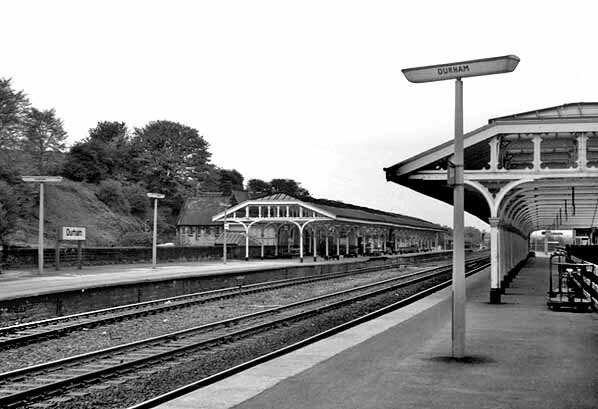 Durham station, looking east in June 1957. The up platform with its generous expanse of glazed platform roofing with a hipped ridge-and-furrow design is shown well. On the down platform the reverse of the BR(NE) tangerine running-in nameboard can be seen. Standing at the up platform, heading a Sunderland to Bishop Auckland train and with just over a year’s service left is 67246, an 0-4-4 Wilson Worsdell-designed G5 tank. 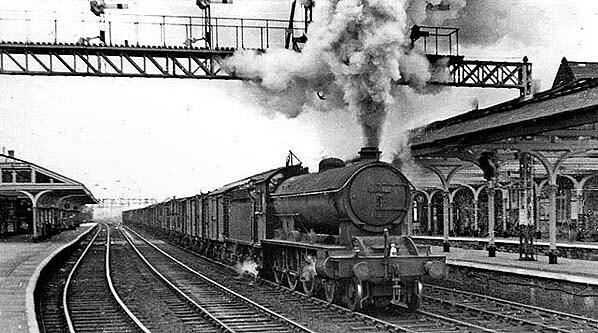 Built for the NER in June 1894 and numbered 1783, it was withdrawn from 54A, Sunderland South Dock shed in November 1958 and was broken up shortly after. 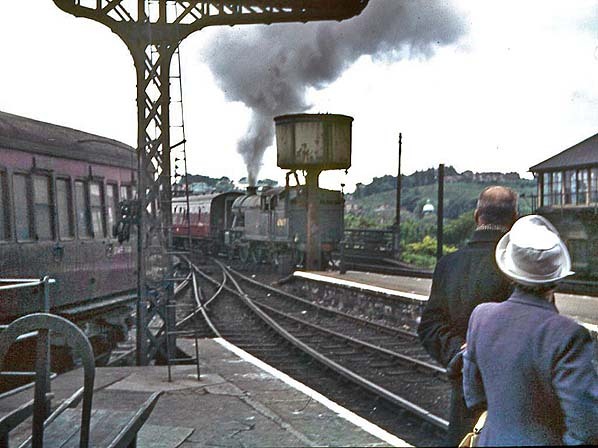 Looking north-east from the down platform of Durham station in 1962. Class A1 60141 ‘Abbotsford’ is arriving at Durham. Note that it has the calling-on signal only; it is about to go onto the viaduct then reverse across onto the down lines to reach the shed site to pick up failed Class A1 60135 ‘Madge Wildfire’ and take it south for scrap in 1964. No.60141 was built by the fledgling British Railways at Darlington works and entered service in December 1948. A Peppercorn- designed A1, it was delivered new to 50A, York North shed, from where it was withdrawn on 5 October 1964. It was scrapped by Drapers of Hull at the end of the year. 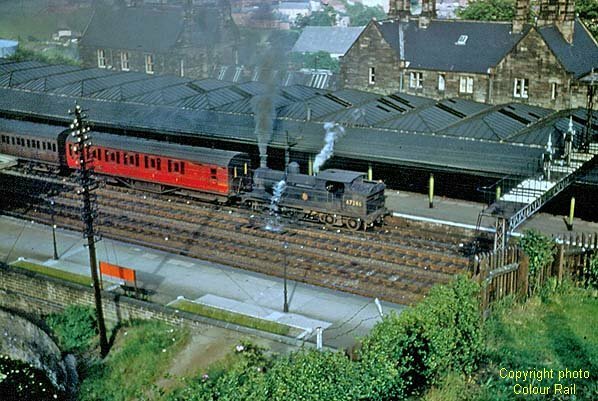 An exquisite shot which captures in colour a moment on Durham station in June 1962. A couple waiting on the bay platform for a Bishop Auckland local train look on as a Gresley Class V3 banker pushes an up express out of the station. The loco is not coupled to the train and will soon leave the train and come back light engine to await the next stopping passenger. The water crane is also a point of interest. Looking north-east from the up platform of Durham station in May 1972. Both platforms are still sheltered by the Victorian glazed verandahs, but that on the up platform would soon be replaced with a modern structure. A back-lit BR Corporate Identity running-in nameboard and fluorescent lighting have been installed. Looking south-west from the down platform of Durham station in August 1978. The track arrangements and modern roofing on the up platform date from 1972. The down platform retains its glazed roofing that was installed in the 1870s. Looking east across Durham station in August 1979. The down platform buildings with generous glazed platform verandahs are seen clearly, contrasting with the less elaborate new roofing on the up platform. A Class 47 is heading an up passenger train through the station. 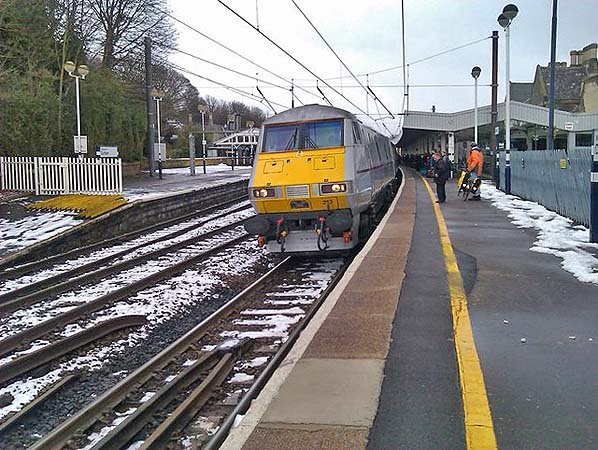 An InterCity 225 (Class 91) in East Coast livery calls at the up platform of Durham station in February 2013. The route was electrified in 1991. 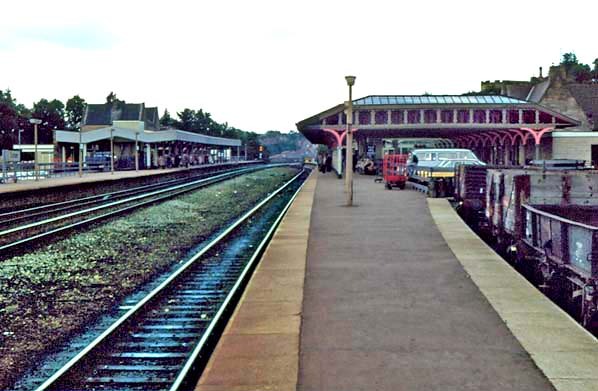 Although both platforms have retained their Victorian buildings, there has been considerable reconstruction, including the removal of the glazed roofing from the up platform in the 1970s, when its austere replacement was installed. Looking north-east along the up platform of Durham station in May 2013. The modern (1972) roofing on this platform contrasts with the Victorian (1871-2) down platform roofing. The mural in the foreground shows the view that will open up to rail passengers as soon as their train leaves the station on its journey south. The façade of Durham station’s main building, looking north-west in July 2013. This dignified building dates from the station’s opening in 1857. It has retained its portico, albeit with alterations, and the chimney stacks have been restored to something like their original height having been all but removed in the 1960s. It is regrettable, however, that restoration of the stonework has given the frontage a patchy, polychrome effect. From left to right we see: toilets, stationmaster's house above the booking office, parcels office and left luggage office. To the right of the building the station hotel has been demolished. There used to be separate booking offices one each platform; that serving the down (northbound) platform closed about 1961.